Prime Minister Rudd's refugee announcement is Australia's day of refugee shame, Greens Leader Senator Christine Milne said. "A rich country like Australia paying off a poor country to take our desperate refugees is passing the buck and an abrogation of our responsibilities to people and the international community," Senator Milne said. "It's not a regional solution, but a radical, right-wing, hard-line response. Manus Island will be Australia's gulag in PNG. The Greens, Amnesty International, the Anglican Church, Refugee Rights Action Network and many others have joined together to host the Refugee Welcome Fiesta in Fremantle tomorrow. The all-inclusive community event marks the end of World Refugee Week and also commemorates Welcome To Australia's national Walk Together. Senator for Western Australia Scott Ludlam said "the dangerous trend of politicians exploiting refugees for political advantage is toxic for all immigrants, and indeed toxic for all Australians. We are gathering to take a stand for tolerance and humanity". 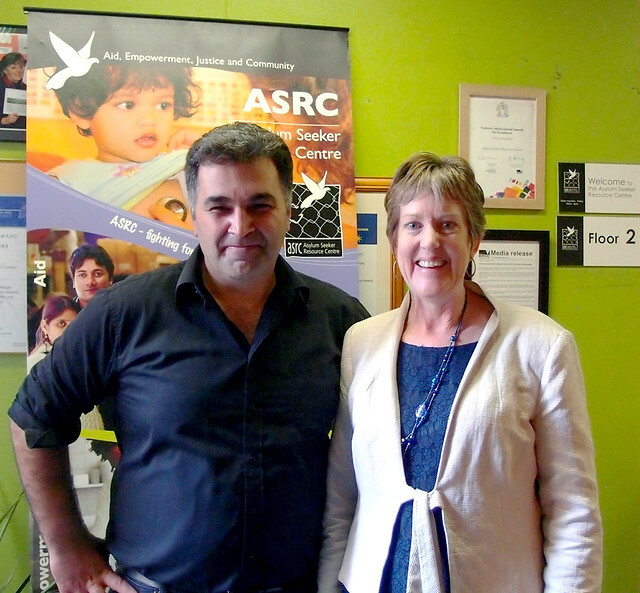 Visit to the Asylum Seeker Resource Center (ASRC) in Melbourne. The arrival of refugees in Geraldton, WA, is a clear sign that the government’s harsh treatment of refugees isn’t stopping people from coming by boat or making them safer. The Australian Greens are calling for an urgent boost in the number of refugees being resettled in Australia. “The government’s policy of cruelty has entirely failed,” the Greens’ immigration spokesperson, Senator Sarah Hanson-Young said. “Offering a secure path to safety means refugees won’t be forced to take dangerous boat journeys. Criticism of the Manus Island detention centre from a member of the government’s own expert panel on asylum seekers shows that Labor’s unravelling Pacific Solution needs to be shut down immediately and children and families need to be brought to the mainland. “Labor’s policy of offshore detention is hanging in tatters and it’s clear that these island prisons need to be shut down,” the Greens immigration spokesperson, Senator Sarah Hanson-Young said. “Children do not belong in detention. The Australian Greens say that the government’s shadowy process of forcibly returning people to Sri Lanka without processing their claims for protection must stop. “This is a potential life and death decision for those involved,” the Greens immigration spokesperson, Senator Sarah Hanson-Young said today. “The government is going down a dangerous road where people are potentially being sent back to very serious danger without having their claims for protection processed. The latest tragic loss of life at sea, together with the record breaking numbers of boat arrivals, point to a fundamental failure of the government’s offshore detention and ‘no advantage’ policies. “The policy has failed to stop the boats and has sadly failed to stop boat tragedies,” said the Greens’ immigration spokesperson Senator Sarah Hanson-Young today. The Greens are calling for an immediate moratorium on the deportation of Hazaras back to Afghanistan in light of the Federal Court’s ruling today. “Now that the Federal Court has intervened the government must instantly commit to not sending any Afghan Hazaras back to Kabul,” Senator Sarah Hanson-Young said today.